Sign spotted in the hallway today at George Mason University. 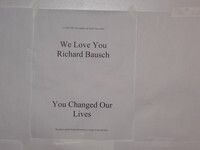 A tribute to Richard Bausch, posted by his students who seem convinced that Bausch is leaving the program. Off to the greener pastures of Iowa? Not necessarily. Iowa was not the only one to show up at the door with flowers and candy. Is Bausch being wooed by another program? Entirely possible. Is Iowa still in the running? You’ll have to ask Iowa. Will Mason step up and match other offers? Eight ball fuzzy, try back later. What the Happy Booker does know is that the George Mason MFA program will not be the same without Richard Bausch. He inspired many writers, the Happy Booker included, and he will surely be missed. fyi: the poster was surrounded by many sheets of white paper, for students to sign and write their messages on.